Topper is the newest member of the African penguin colony at Adventure Aquarium on the Camden waterfront. 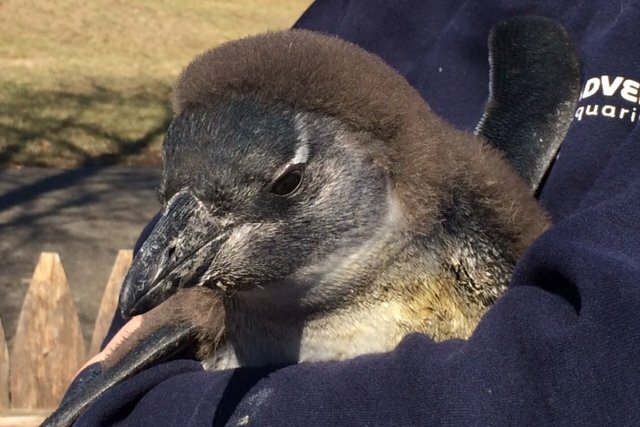 Topper, a fledgling African penguin born Christmas Eve at Adventure Aquarium on Camden’s waterfront, is making cameo appearances most days and getting ready to join his colony. The burly baby – at more than five pounds, he’s heavier than some of the adult penguins – is putting on weight as his down-covered body grows out a new suit of waterproof feathers. Right now, he – or maybe she, as there is no way of telling until Topper is older and has blood drawn and analyzed – is about 50 percent through molting, his front and face covered in sleek feathers, his back still a powder puff. Which is why the staff and Jennifer Duffy, the senior biologist at the aquarium, are making certain Topper stays strictly in hand during brief solo public appearances – just after most feeding times for the colony. The colony has access to a pool, but down and water just do not mix. So, for now, no swimming for Topper. Besides, at this stage in Topper’s development, the penguin doesn’t yet know it can swim. Duffy said Topper will be gently coaxed into the water when the time comes, which could be just two weeks, or more likely a month. It will all depend on how fast the down switches over to feathers, she said, and on Topper’s temperament. Meanwhile, the bird is getting acclimated to the aquarium and keepers, who will act as an extension of the colony. Already famous online, Topper stretched his wings on Saturday under the watchful eye of keepers. Topper waddled about, making pleading sounds for attention and a feeding. Topper checked out twigs, leaves and a reporter’s pen, none as palatable as the 15 to 20 pounds of whole small fish consumed every day. The bird is the ninth for parents Minnie, 19, and Kamikaze, 20, both of whom are from the original stock of African penguins brought to the aquarium. Overall, the colony has produced 20 chicks. Duffy said 20 years is an average life expectancy for the penguins in the wild, though captive birds often live until they are 30 because there are no predators, they are fed routinely and monitored by veterinarians. Topper weighed just a few ounces when hatched from an egg about twice the size of a chicken’s. The baby bird remained with Minnie – 5 shows on her wing band – and Kamikaze – his band reads 18 – for weeks, but membership in a captive colony requires learning to be fed by keepers, which requires socialization with humans. While captive colonies cannot be released into the wild because they have lost their fear of humans, the captive birds do assure a genetic fallback should some sort of penguin apocalypse crash the wild population, explained Duffy. The aquarium and other captive facilities are part of the Association of Zoos and Aquarium’s African penguin Species Survival Plan, providing a diverse DNA base among the 800 captive birds in the states should seed stock be needed. While there are perhaps 200,000 in the wild, African penguins are endangered, through their smaller colony sizes (larger colonies provide greater protection), habitat loss, proximity to shipping channels and oil spills in their native South Africa, explained Duffy. The aquarium also raises money for natural conservation initiatives for the birds in their native habitat. And while Topper is only briefly on view at the moment, his colony of African penguins was joined on Dec. 28 by a small colony of little blue penguins, which hail from Australia and New Zealand. The adult birds – more slate gray than blue – are more vocal in making calls and swimming than their African cousins. Megan Rion and her husband, Charlie Schwinger, brought their son, Jameson, and their son's friends, to the aquarium for his eighth birthday on Saturday, in part because of the blue penguins. “We love it,” said the Morrisville, Bucks County mom. “It’s an awesome aquarium,” added Rion, who will be back to see Topper since the family bought a seasonal pass. For information about visiting, click here.